This Keyboard Maestro macro set will create a brand new perspective for viewing your TaskPaper tasks! The first macro (TP3—Jim’s Matrix Macro) sets up the matrix view, and it is triggered by ⌃-e. The second macro (TP3—Jim’s Matrix Macro Reboot) restores the original view with ⌃-r — These keyboard shortcuts can be changed in Keyboard Maestro. Wouldn’t it be great if TaskPaper would help you choose which tasks or projects to do? It occurred to me that TaskPaper could do exactly that with the help of Applescript and Keyboard Maestro. The attached pair of macros are designed to help you get immediate clarity when viewing your tasks and projects. I was reading an article about a productivity idea called the Eisenhower Decision Matrix by Dwight D. Eisenhower. You can read about it here. Stephen Covey copied this idea and promotes it in his books. The basic premise is that every task can be quickly defined by two elements: Is it important? Is it urgent? Once you know those, you simply focus on the tasks that are urgent and important. When you finish those, you can tackle the remaining important (but not urgent) tasks, then proceed to complete the urgent (but not important) tasks. How to do this in TaskPaper? Well, when you make a task or project in TaskPaper, first decide if it is important. This should be a fast and easy decision. If it is important, you tag the task with: @important. Second, if the task has a due date, tag it with one: @due(2017-10-15). When you first start using the matrix decision system, you may need to invest a little time adding @important and @due tags. In my opinion, this will be time well spent. As you get used to using this system, you will find that it takes trivial effort to add tags when you first create the task. By viewing your tasks in this 2×2 matrix, you will have a new perspective on your priorities. This matrix helps me focus on what to do now, and it effortlessly eliminates decision procrastination. I hope it does the same for you. 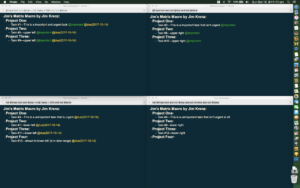 Each of the four windows are live views of your TaskPaper document. Any edits, tagging, etc., done in any of the windows will be saved in your file. If you really want to focus in, you can close the three windows you aren’t using at the moment. I will often close the lower right quadrant, as this hides tasks that might otherwise distract me. One of the benefits of TaskPaper is that it is utterly customizable. Pretend that you are Neo, and use the Matrix to free your mind! 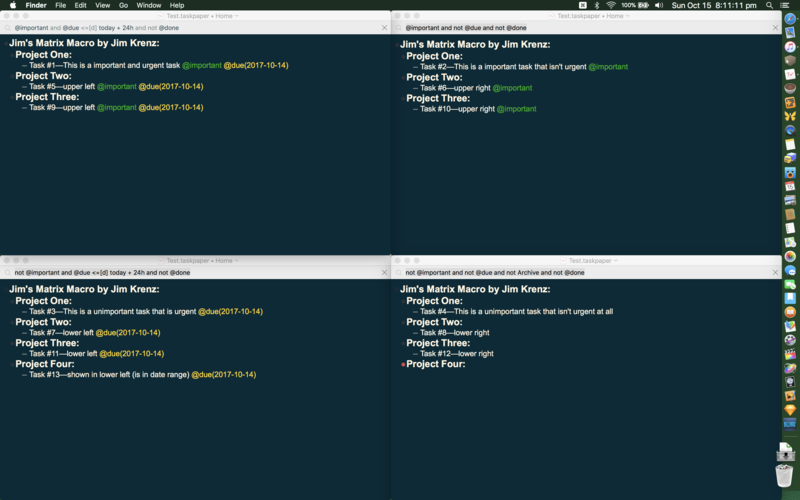 When you are ready to return to your normal TaskPaper view, invoke the second macro (Jim’s Matrix Macro Reboot). That will close all but the frontmost window, resize and position the remaining window to a normal view (I have it set to full screen height and 69% width) with the sidebar showing (my personal default view of TaskPaper documents—you may wish to edit the script so that your preferred view choices are executed). After each macro finishes, I have the macro say a quote from the movie, the Matrix. I do this because it tells me that the script is done executing, and because it makes me smile (these being “Matrix” macros and me being a fan of the original movie). If you don’t find the quotes to be fun, you may wish to replace the [say “…”] command with [beep] — which will play your system’s beep sound when the macro finishes. I love these macros. Not only do they make me more efficient and productive—I am thrilled each time I activate the Matrix view (cue Neo saying: “I know AppleScript Kung Fu!). I love being able to apply a unique productivity decision technique to the TaskPaper application through automation. Try doing this in another task app—odds are you will fail, as they are rigidly designed. TaskPaper is designed to be flexible, adaptable and customizable. Thank you Jesse Grosjean! Inside the macros, I have kept my AppleScripts compartmentalized. This will allow you to (more) easily customize the macros. It you have questions, please ask in the support forums. I have found the matrix display to be very helpful when choosing my daily tasks and projects. I hope it helps you as well! If these macros help you to be more productive, don’t forget that donations are always appreciated!